This post is the second half of our trip report from Honduras. You can read about the first half of our trip here. This was mostly a travel day for us. We left La Tigra and headed to Marcala in the morning. On the way we made one stop, just outside of Tegucigalpa, at the United Nations Park. We had some great looks at species such as Rusty Sparrow and Crested Bobwhite and the views of Tegucigalpa were incredible! We arrived at Hotel La Casona (just outside of Marcala) in the afternoon, so we had a few hours to bird their fantastic grounds. Among the highlights were Crested Bobwhite, Northern (Guatemalan) Flicker, Greater Pewee, Rusty Sparrow, and a few species of orioles. The highlands of Opatoro were our destination on this day. This area isn’t visited as frequently as the other birding locations in Honduras, but there are a couple specialties that are quite common in this area. 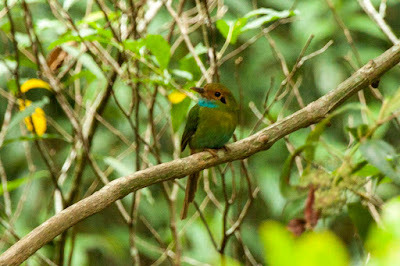 Our first stop produced our most-wanted bird for the area; the beautiful Blue-throated Motmot. The motmot is a common species throughout the area and we ended up detecting 8-10 individuals. 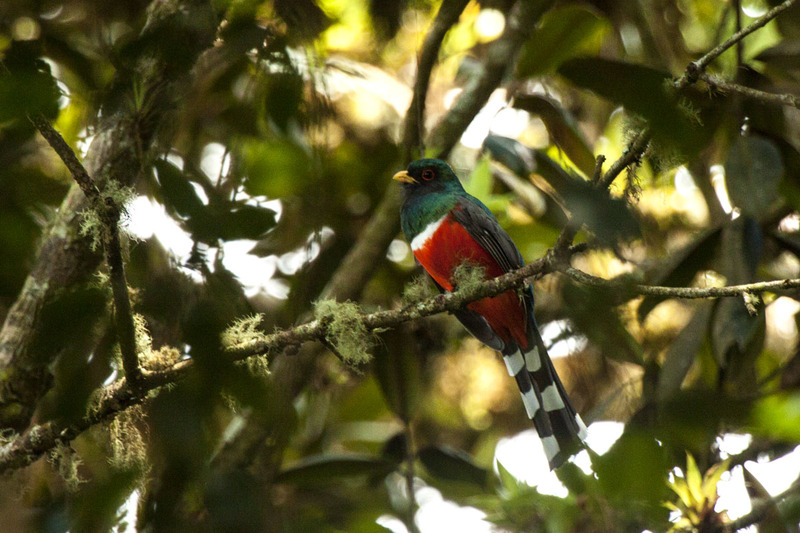 Since we had missed Resplendent Quetzal at La Tigra, we spent some extra time tracking this species down. After hearing our first one, we eventually tracked it down had some great views. And, to our surprise, while watching the quetzal, we had not one but two Fulvous Owls! Two Emerald Toucanets were also quite amusing as they harassed the owls but made sure not to get too close at the same time. This was one amazing spot! In the afternoon we headed further up the mountain to a location for Rufous-collared Robin. It was a great location with 4-5 individuals being present, even though it was in the middle of the afternoon. 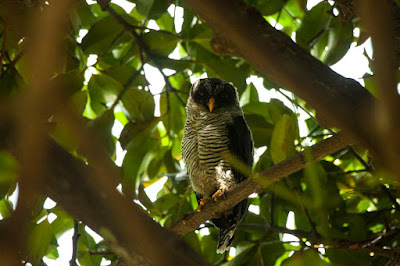 We headed back down to the hotel in the early evening since we had already had success with Fulvous Owl earlier in the day. A short watch for swifts from the hotel grounds only turned up White-collareds. Our travel plans changed a bit on this day. We took an alternate route from Marcala to PANACAM to look for Ocellated Quail and Green (Red-throated) Parakeet. We started out the day birding the grounds of Hotel La Casona, obtaining great views of many of the usual species in the area. After birding the grounds and having breakfast, we headed for the nearby pine-oak forest. After speaking with some construction workers in the area, we learned that they see quail quite often in the area. We ended up hearing one individual, but were not able to get a visual. While making our way towards La Esperanza we picked up Steller’s Jay and Sedge Wren among a few other highlights. We arrived at PANACAM in the middle of the afternoon, so we had a few hours to bird the grounds and the nearby trail. The hummingbird feeders were fairly active with White-bellied Emerald, Violet Sabrewing, Stripe-throated Hermit, and Rufous-tailed Hummingbirds showing well. The trails also produced some nice birds such as adult and juvenile Keel-billed Motmot, Bat Falcon, Northern Bentbill, as well as Olivaceous, Cocoa, and Ivory-billed Woodcreepers. We had many options on our birding plans for our one full day at PANACAM. We chose to try for the only Honduran endemic, the Honduran Emerald. Alex had started to work on access to a private property, to the west of Santa Barbara, which we were able to visit. While finding the property turned out to be difficult, finding the Honduran Emerald turned out to be quite easy. We had multiples within minutes of stepping out of the car and ended up with 7-8 individuals. Other highlights on the property included Elegant Trogon, Lesser Ground-Cuckoo, Plain-capped Starthroat, and Berryline Hummingbird. We spent the afternoon birding around Lake Yajoa which produced a number of highlights including Rufous-breasted Spinetail, Olivaceous Piculet, Rose-throated Becard, Rufous-and-white Wren, and Green-backed Sparrow. We had the morning to bird around PANACAM before leaving for San Pedro Sula and eventually The Lodge at Pico Bonito. We were able to add a few more species in the morning such as Brown-hooded and White-crowned Parrots, Sepia-capped Flycatcher, Louisiana Waterthrush (a newly arrived migrant), Passerini’s Tanager, and Black-headed Siskin. Once arriving in San Pedro Sula, we met up with Elmer Escoto from The Lodge at Pico Bonito. We had to bid farewell to our birding companions of the last week, Alex Alvarado and Gustavo Poublanc. We arrived at Pico Bonito in the early afternoon, and after a short lunch break, we began birding the grounds. This is the slow time in Honduras and it was very noticeable at Pico. We struggled to find many birds throughout our visit but we did see a few quality species. A Great Potoo and a family of three Vermiculated Screech-Owls made the first afternoon a success. The number of swifts at Pico Bonito is incredible-we estimated at least 500 White-collared Swifts and 25 Vaux’s zipping around overhead. We started this morning at Toucan Tower and then hiked the loop trail. We started off well with good views of two White Hawks from one of the valley overlooks, and followed it up with a Lovely Cotinga from Toucan Tower. The hike on the loop trail was exceptionally slow, but we did see a couple Violet-headed Hummingbirds, Chestnut-colored Woodpecker, both White-collared and Red-capped Manakins, and Long-billed Gnatwren. After a short break in the middle of the day we headed to La Ceiba to look for Black-and-white Owls that had been roosting at CREDIA Botanical Gardens. We weren’t disappointed; there were three roosting within the same tree! 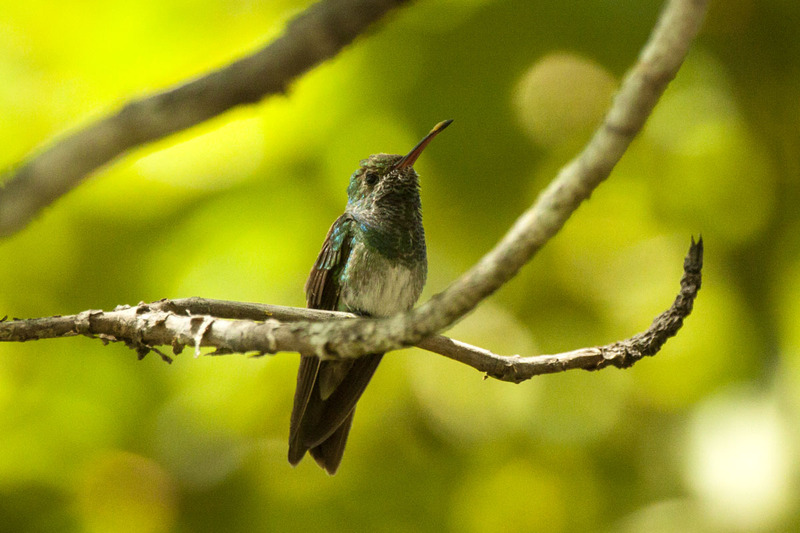 Our next stop was Rio Santiago Nature Resort, one of the best places in Honduras to watch hummingbirds. Not only are there hundreds of hummingbirds flying around the feeders, the diversity is also impressive. We had 13 out of the 26 species that have been recorded here. While hummingbirds are the stars of the show, the Spectacled Owls are a close second. We had two individuals roosting next to each other, just down the road from the hummingbird feeders. There are also many other species around the property and it is a must visit if birding in Honduras. We chose to bird Cuero y Salado National Park on our last full morning of the trip. To get to this location you have to catch a small train that takes you 7 km to the visitor center. The train moves slowly and travels through fields and marshes, so you can bird along the way. Once you arrive, you can take a boat through the mangroves in hopes of finding many species. This is a great location for Agami Heron and Sungrebe. We missed both of these species but our highlights did include Boat-billed Heron, Plumbeous Kite, Gray-necked Wood-Rail, American Pygmy Kingfisher, White-necked Puffbird, and Black-crowned Antshrike. You can also walk to the beach from the “train station”. Magnificent Frigitebirds are quite common and we also had Black and Least Terns from the beach. We finished up our trip by birding the grounds of the lodge without adding any species, other than a cooperative Mottled Owl. 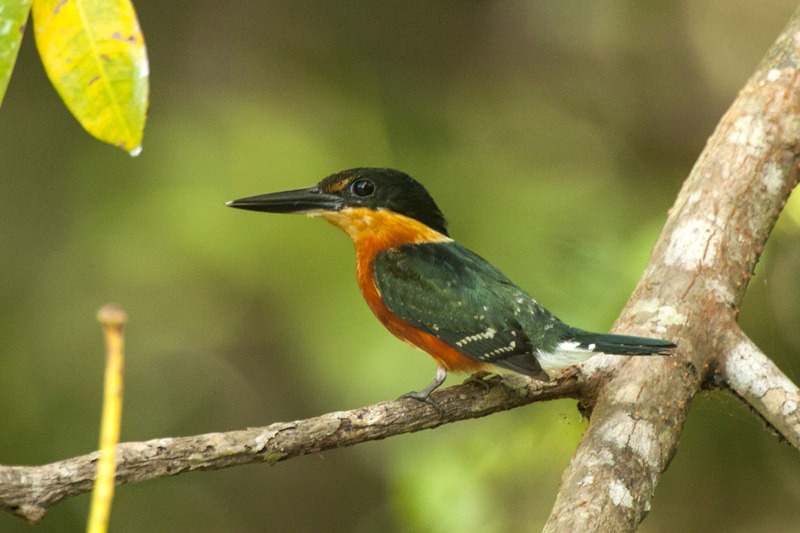 For information on Sabrewing Nature Tours trips to Honduras check out our website by clicking here.